Trading momentum is paying-off in the current market environment. Swing trading breakouts making new highs on volume at least 100% larger than the average is king. It’s working so pay attention and be smart while putting on trades. MTL is no longer a buy since it has become extended but TITN and RIO may be setting up for new 52-week highs. 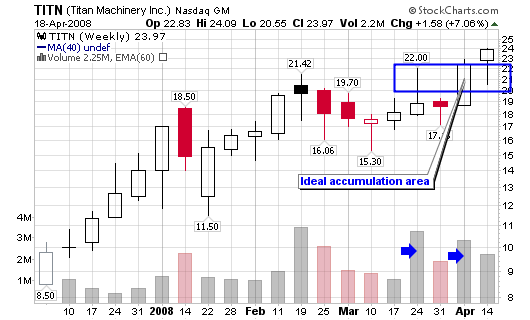 Fourth quarter earnings are scheduled for Monday, April 28, 2008. I would not be a buyer until after earnings are released (this event will shape my view on the stock and a potential position). Last quarter’s net income rose to $2.7 million, or 36 cents a share, from $0.8 million, or 13 cents a share, a year ago (sales increased 67% to $132 million). My ideal accumulation area is between $19 and $22 with the best entry coming along the 50-day moving average, which seems to be providing support. The weekly chart is showing clear accumulation by institutional investors as most up-weeks are happening on larger volume while down-weeks are happening on lighter volume. I will definitely be interested in a position since this stock has been making my nightly screens and scans since February. I have learned that the best stocks are the ones that continually make these scans (that is fact since I started investing with this method in 2001). Titan Machinery Inc. owns and operates a network of agricultural and construction equipment stores in North America. It is a retail dealer of Case IH Agriculture equipment and a retail dealer of New Holland Agriculture, Case Construction and New Holland Construction equipment in the United States. The Company sells and rents agricultural and construction equipment, sells parts, and services the equipment operating in the areas surrounding its stores. The agricultural equipment it sells and services includes machinery and attachments for uses ranging from large-scale farming to home and garden use. The construction equipment it sells and services includes heavy construction and light industrial machinery for commercial and residential construction, road and highway construction and mining applications. In January 2008, the Company acquired Avoca Implement and Greenfield Implement, two CaseIH farm equipment dealerships in Southwest Iowa. Great Site and commentary. 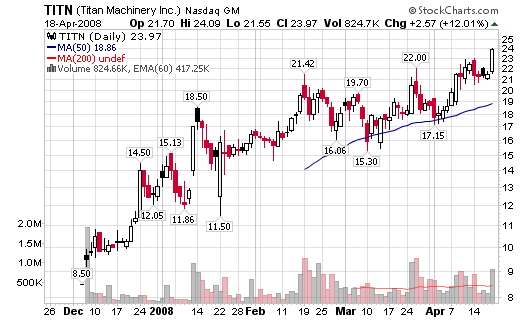 About TITN, when the earnings reports are announced on Monday, 28 April 2008, assuming they are good, I am under the impression that the stock price will go up. You indicate that you would like to get in around $21, yet it closed at $22.34, and presumably will only be going up. How do you expect to get in at $21? Will you set a buy order for $21 and hope it dips so as to buy on the pull back?? Would be interested in your philosophy as I am interested in trading this one myself and am curious as to how to get in at your ideal price? You could buy now and hedge with a put option to protect the downside risk. I don’t like buying into earnigns, especially in vulnerable markets like we have now. I may not be able to get in near $21 but I will take a look at the landscape after earnings. I’ll report back here in the comments after they release. Thx for the propmt reply. Will tune in for your comments after they release. Any comments on thier press release yet Chris? I would have to say that they looked solid. They even revised their outlook for next fiscal year. Too bad I didn’t have the guts (or the rules) to buy on Friday prior to today’s release. It’s a buy in my book, now I have to try to get in without the stock extending to high from the moving average. I will review the chart closely tonight and probably put in a buy order for tomorrow. TITN seems to be under selling preassure. It shed around 17% in just 3 days in more than average volume. Chris shouldn’t this be a major warning sign? No problem getting in under $21 now, I wonder if this is just a pull back for another rally? I hope so! Thoughts Chris? Are you still going to get in? Buying on a pullback is better than buying into rising prices. I am going to get in today!! !